On Sunday morning we explored Shinjuku, where we were staying. We sheltered from the rain in various department stores, marvelling at the toys and too timid to try on the clothes. Michael had four veg-friendly lunch destinations up his sleeve but the first one, Chaya, had a queue of more than a dozen hopefuls seated out front. We were time- and train-sensitive so opted for the next closest venue, Ain Soph Journey. We'd visited Ain Soph last year for dinner and so knew roughly what to expect. The menu mostly contains English translations, has many instructive and attractive photos and appears to be entirely vegan, so it's not too difficult to pick out a meal. Our waiter, however, didn't speak any English and valiantly continued to speak Japanese to us throughout our visit even though we tried to make it clear right away that we couldn't understand. At lunch time Ain Soph tend towards set menus - a multi-course banquet runs to 2800円 (~AU$30.20) but other savouries with salad are 1800円 (~AU$19.40). Salads are piled up into pint glasses and served with salty soy and vinaigrette dressings. 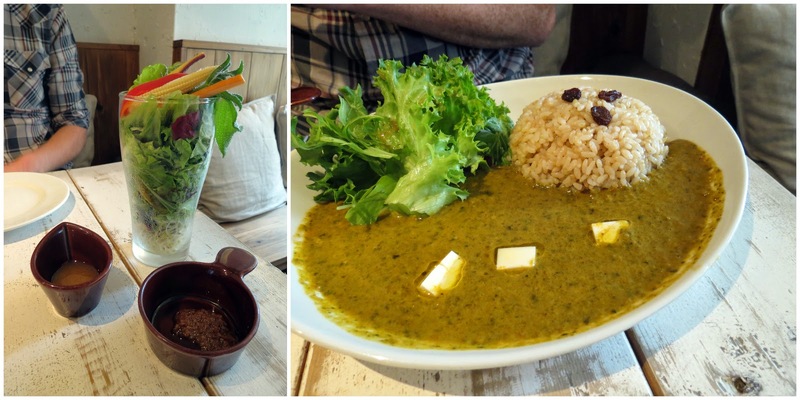 Michael's green curry (one of the cheaper lunch specials) was like a palak paneer with three tofu cubes replacing the cheese, tasty and soupy with brown rice and more fresh greens on the side. Ever the sweet tooth, I ordered from the dessert menu. Unfortunately, given our limited ability to communicate with our waiter, this meant that Michael had finished his salad entree and his entire curry before this was brought to the table. 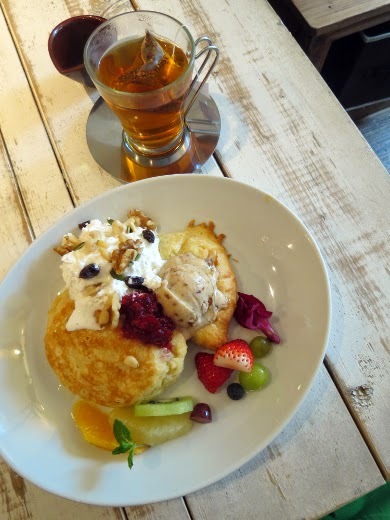 He couldn't help but pick at my fluffy vegan pancakes (1400円 ~ AU$15.10) - they were really good! Toppings were abundant - aerated soy cream, date icecream, berry compote, fresh fruit slices and a scattering of nuts and seeds. My wild strawberry tea (600円 ~ AU$6.50) was the ideal tangy, fruity accompaniment. Our previous review of Ain Soph Journey was tepid, but this time round they proved themselves capable of much more than we'd given them credit for. We only regretted that we didn't have time to linger over their banquet. You can read about our first visit to Ain Soph Journey here. 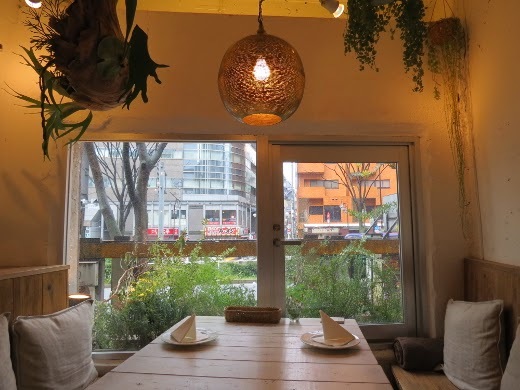 Since then it's received many positive reviews on other blogs, many of them in Japanese - see Tokyo Chillin', Bon Voyage Vegan, NPO Japan Vegetarian Society, meg, Happy Lucky, Tokyo Today Tokyo, Active Vegan and My Secret Place. Accessibility: The entry includes a half-flight of stairs. Half the tables are downstairs and another half are up a full flight of narrow stairs; all tables are densely arranged. We ordered at our table and paid at a high counter. We didn't visit the toilets. Magnificent! Love reading your travel adventures :) Japan is my dream destination, hoping to go on a family trip there in the next few years. Thanks, Veganopoulous! I hope do hope you make it - it strikes me as a very safe and family-friendly country.